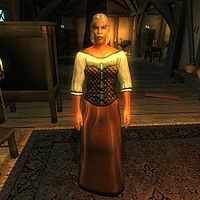 Carmen Litte, a Redguard commoner, is the wife of Alberic Litte, a spell merchant and trainer at the Chorrol Mages Guild. She is not a member of the guild herself, but is generally found either at the guild hall or walking around town with her husband. She sometimes sleeps at the guild, too. She wears middle class clothing which consists of a quilted doublet, tan linens and a pair of doeskin shoes. She also carries her house key and a reasonable amount of gold. When you greet her for the first time, she will tell you that "I'm Carmen Litte. Perhaps you know my husband? Alberic Litte, the Mages Guild sorcerer? What can I do for you?" and when asked about Chorrol, she replies "Are you a student of the Arcane Arts? My husband, Alberic, is an Advanced Trainer in Conjuration at the Mages Guild."